Treating others with disrespect says nothing about their character, but everything about yours. Others shouldn’t have to earn your respect. Give it freely, regardless of the respect that you receive. Why? Because everyone has worth as a human being and deserves our respect. You don’t have to like everyone and you don’t have to have to agree with them. Their opinions may make your blood boil and their actions may make you cringe. Treating people with respect does not mean that you endorse their ideas or behaviors. It means that you are willing to show respect to an individual without respecting their actions and decisions. 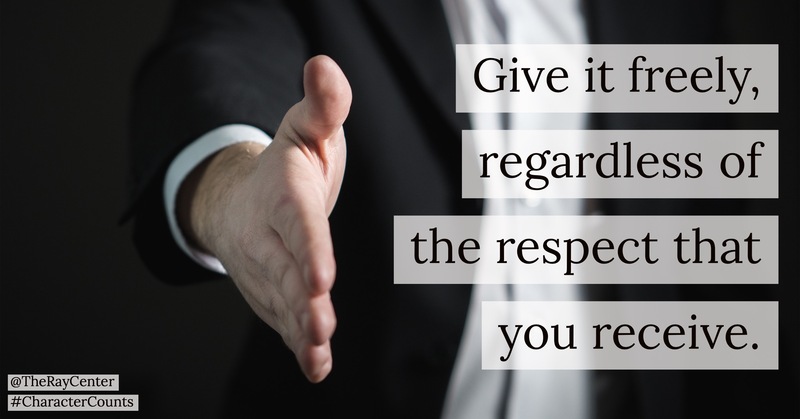 We’ve heard many people say that that respect is earned. But why would we let someone else’s behavior dictate our own character? Isn’t who we are too important to be left up to someone else? Taking the proverbial high road doesn’t provide you with the instant gratification of shouting at someone in traffic or the satisfaction of criticizing someone because their beliefs are different than yours. However, it will provide you with practice. Each time you show respect, you are strengthening your character. Think of your character like a muscle. Every time you use it, it will get stronger. The stronger you become, the easier it will be to do next time. After all, aren’t we all just trying to do it better next time?